It’s time to look at an old party game I have for the PS3. Oddly enough, even though I played the games back in the day I never bothered to actually upload it to the site or anything. Well, it was a good excuse to go back and replay the game for the review, but unfortunately it isn’t as good as I remembered it and I already knew that it was a bad game. I dare say that this could be the worst party game of them all and that’s saying something. At the very least it gives the bottom tier ones some competition. There are 5 minigames total. That’s already a pretty sad number when you consider that this is a PS3 game. I mean, you could have a little excuse for this if it was for an older system, but for the PS3 I expect more. There is nothing else to do in this game so if you’re looking for some good replay value look elsewhere. I mean, I suppose you could go after the Platinum trophy, but you’ll have to sink in a decent amount of hours for that and with how many luck based trophies there are it could be a while. I think you can cheese most of them through two player mode if it helps. You will also be gathering some Potato Head costumes along the way which I guess should be interesting. Lets look at the actual games though as a party title lives or dies on those. We’ll start with 2 of the good ones. The first is Twister. It’s pretty self explanatory except they misspelled Dance Dance Revolution. After all this Twister game is nothing like Twister. You hit the right buttons as they pass the screen. It’s the exact gameplay of a DDR game, but without having to actually dance and hit the buttons yourself. It’s an easier way of doing it, but less engaging. Still, on its own I actually like this minigame. There was a reasonable amount of effort put behind it and the core gameplay is just fun. Not to mention that there is less waiting on this one since I believe each player tries to match the notes simultaneously. The next minigame is Yahtzee. This one must be easy to develop or something since it seems to be the old standby for pretty much all of the party games on the block. Well, that’s not a bad thing I suppose since the gameplay isn’t half bad. The problem is that they add a Hands Down! mechanic where you have to get a certain combo and then fight someone with the same one. I don’t get the point of this and it just takes away some of the fun. It drags the games out more than they should be since it forces everyone to keep going until 2 people have the exact card combination. Of course dragging things out is exactly what this game likes to do as you’ll see in the next 3 games. Next up we have got Mouse Trap which is basically a movie. You roll the dice and move through the board that has no ending. The goal is to pick up a lot of cheese which you get by landing on a cheese spot. Thing is, you can’t control anything except for dodging some traps by pressing x at the right time. Beyond that, you just follow the dice and keep on rolling until you get your cheese. This can take over 15 minutes, likely longer if you play multiplayer. The problem is that the cheese traps take your cheese away and the odds of getting a lucky roll to land on the cheese 6 times is quite low. At least, it’s low if you want to finish at a reasonable time. I think my problem with this is that you aren’t really doing anything so is it really a game at that point? It’s 100% luck and that’s not cool. There is absolutely no point to the game and it takes too long to finish. Making it more interactive would have helped a lot. Life falls into the same traps. This one has you on a long, straight board without any real mixups or elements to make it interesting. You want to retire and whoever does so first wins. So, to do that you spin the dice and watch where the road takes you. You do get some slight options like choosing 3 cards out of 9 but they are all random so you can’t see what it is anyway and then you pick your favorite card which will give you some effects. You won’t know which effect you’ll be getting though since you have to wait until you roll the dice for that. Everything is just so random and nothing is explained properly. It’s another really boring auto game where nothing is happening. Finally we have Clue. This one is a slight improvement over the last 2 but not by much. At least you are trying to solve a case and you can choose in what direction you move. On the other hand, a lot of time is wasted for the many special effects that happen every turn. Whenever someone turns on the lights we get a cutscene and either a suspect is eliminated or one of the players will lose a turn. Either way it takes up time and if someone rolls a house party effect then everyone is reset back to their original positions. This is the longest cutscene by far as it’s almost a full minute and the computer activated it multiple times during our encounter. The minigame is pretty faithful to the board game, but it’s nowhere near as fun. Family Game Night just didn’t realize how to make the board games fun in video game format and that is the big problem here. The game could and should have been a lot of fun, but instead it is just too drawn out. There are also loading times between every game that take up a lot of time. It’s the same cutscene for each loading time as well which doesn’t help matters. Each game also gets an unskippable intro that isn’t as amusing as it seems to think it is. The game is definitely not optimized. As far as the graphics go, it’s certainly not PS3 level. I doubt that a lot of serious effort was put into this game. It was probably slapped together very quickly and rushed out to stores for the $$$. Hopefully it didn’t work as I can’t imagine buying it for full price and then realizing how terrible it was. At least Game Night 4 heavily improved upon this game but there is still no excuse for starting out this badly. At least give us a good soundtrack! Overall, This game is brutal. I’m not going to mince words here, the game is terrible! There’s no heart behind the game and the actual game selection is bizarre. You shouldn’t have 3/5 of the games be all about rolling the dice and hoping that you get the right number. It probably saves on production costs since the games are so similar, but it’s not great from a player perspective. There won’t be any point where you are actually enjoying this game enough to justify buying it. I highly recommend avoiding it and if you want a decent party game check out the Mario Party series. That one gets in a proper balance of skill and luck while also making sure that no minigame overstays its welcome. That’s how you make a party game. 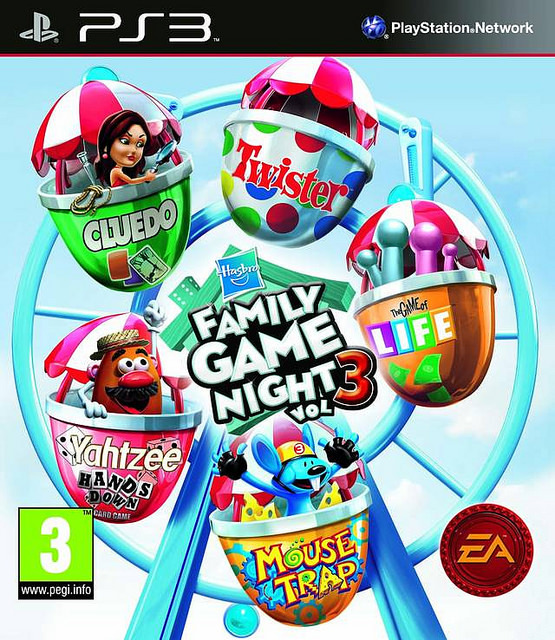 This entry was posted in 3 Star Games, Game Reviews, Games, Reviews and tagged Clue, EA, Family Game Night 3, Game Review, Life, Low Effort, Party Game, Playstation, Playstation 3, PS3, Review, Twister, Video Game Review by dreager1. Bookmark the permalink. I looked up The Game of Life out of curiosity since it’s my favorite of the classic board games. Yeah, didn’t seem that good. I think my favorite digital version is the old PC/PS1 version. It’s the most fun I had in a digital version of Game of Life after the good 80s version of the board game. Definitely! But not the crappy versions with the Life tiles. And not the hard-to-read first version with black spaces. The one that looks like the version on the Wikipedia The Game of Life page… but in English, obviously. Okay, I see the one you mean. The game definitely got a lot of versions over the years! Next time I play it I’ll be sure to try out the real version. DO people remember the game of life 1998 that was my childhood.